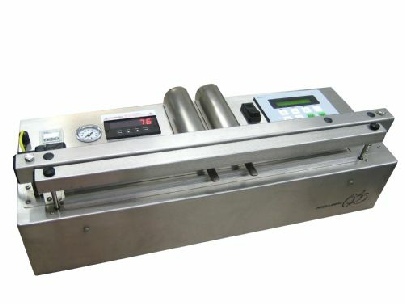 Medical Validatable Vacuum Impulse Heat Sealer is available in 20”, 25”, 30” or35” heat seal bar lengths. Digital validatable temperature controller allows you to program the medical vacuum heat sealer to required temperature settings and the release temperature for the cool cycle. Variable heat seal timer ensures control over the amount of time heat is applied to your package. Each medical vacuum heat sealer for medical packaging is validatable and NIST traceable. Contact for quote and specs.